Does your family like chicken for dinner? Chicken is a dinner favorite at my house. 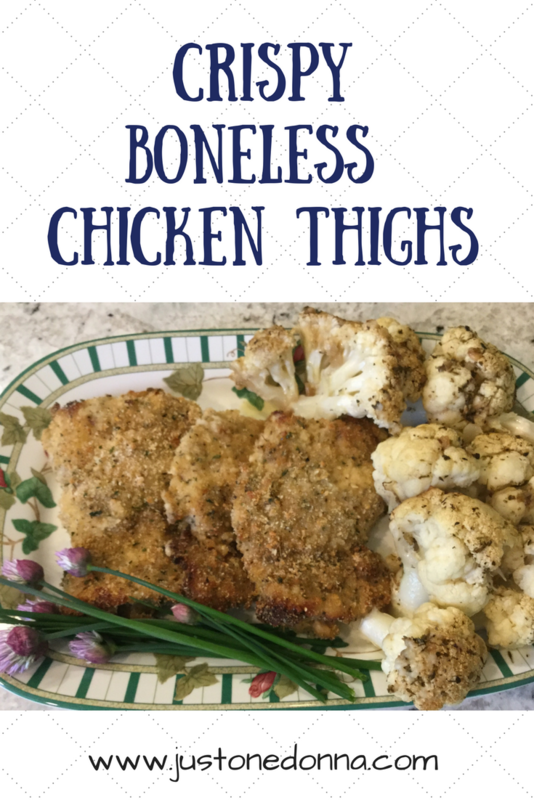 In the past few years, I have been cooking more and more of our family dinners using boneless chicken thighs. I think chicken thighs are more flavorful than chicken breasts so I started substituting chicken thighs in recipes where I previously used chicken breasts. My family and I liked our favorite chicken dishes with the chicken thighs. Now I find myself thinking about how many ways I can use chicken thighs. 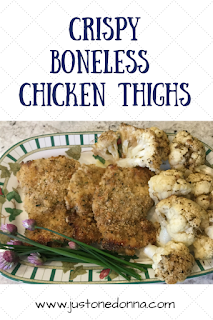 This crispy boneless chicken thighs recipe is a favorite of mine. It is a dish that is quick and easy to prepare and is packed with a lot of flavor. Marinating the chicken thighs in an oil-based Italian salad dressing tenderizes and flavors the meat. Coating the thighs in herb and Parmesan cheese flavored bread crumbs adds the crispy crunch and much more flavor. With only five ingredients, this recipe for oven baked chicken thighs only takes a couple of minutes to prepare. That makes this recipe perfect for a busy weeknight dinner. 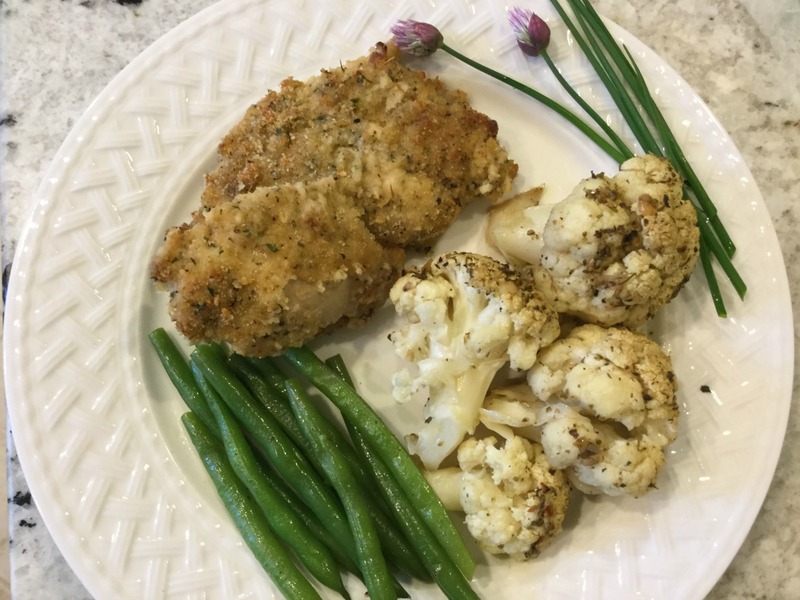 I like to serve these crispy boneless chicken thighs with green beans and oven roasted cauliflower, making this a healthy and well-balanced dinner. Rinse the chicken thighs and pat them dry. Place the thighs in a glass or ceramic dish and cover them with Italian dressing. Make sure the thighs are well coated with the dressing. Cover the dish and refrigerate for a minimum of two hours, or overnight. Preheat the oven to 350 degrees F. Spray a baking sheet with oil. In a small bowl mix together the seasoned bread crumbs, Parmesan cheese, and Italian herbs. Pour the mixture onto a plate, coating each of the thighs completely in the mixture. Place each prepared chicken thigh on the baking sheet. Bake for 35-40 minutes or until the chicken thighs are browned and cooked to an internal temperature of at least 165 degrees F.
Sounds delicious! I never thought about the Italian dressing or using thighs. My mom always coated her chicken with a dusting of corn meal for crunch! I hope you'll give this recipe a try, Quiltingranny. It's a winner with my family! It's nice to have you back. I've missed your comments. These look great! We love baked chicken and this sounds like an awesome way to try it! Kim, this is a very easy recipe that I'm sure your family will love. Good luck!